PT United Tractors Tbk - UT or known as "United Tractors" is a leading public-listed heavy equipment and mining company in Indonesia. United Tractors - listed on the Indonesia Stock Exchange (IDX) under ticker code UNTR - has business focus on three business pillars: Construction Machinery, Mining Contracting and Mining. PT United Tractors Tbk is a mining subsidiary company of PT Astra International Tbk (Astra Group, IDX:ASII), a large and solid business group in Indonesia. As today, Astra Group holds 59.50% shares in United Tractors. Other 40.50% remaining shares in United Tractors was owned by general public. 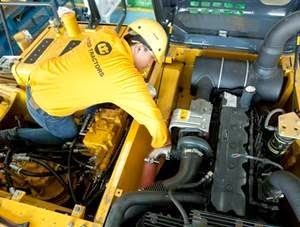 Based in Cakung Jakarta, United Tractors now has 19 branch offices, 22 site support offices, 11 representative offices, 14 mine offices, 39 workshops, 8 re-manufacturing facilities, 117 warehouses spread all over Indonesia. PT United Tractors Tbk conducted business operations in all parts of Indonesia under the management of 12 subsidiary / affiliated companies. In the first quarter of 2017 (1Q 2017), United Tractors was able to achieve a better performance compared to the same period at 2016. According to PT United Tractors Tbk 1Q 2017 financial report as cited by JobsCDC.com, United Tractors booked total consolidated net revenue of Rp13.7 trillion in 1Q 2017. This number is up 28% from Rp10.7 trillion in the same period 2016. Referring to its financial report, United Tractors registered total net income of Rp1.5 trillion in 1Q 2017, increased 105% compared to Rp730.5 billion in 1Q 2016. Bachelor of the Arts (BA) or Bachelor of Science (BS) degree in Computer Science or relevant practical experience. Have advance knowledge of database management system (Oracle, SQL, DB2). Have senior experience of handle entrpreside data. Have developer programming background, such as C, Java, C#, Phyton, R and for hadoop with Spark, MapReduce. Have advance knowledge of translate transformation rule and process into the system. Technical experience in hybrid apps development using Apache Cordova or Ionic Framework - developing application based on Object Oriented Design Principles. Familiar with version control system (e.g. Git). Familiar with security vulnerabilities in mobile application. BA/ BS degree with minimum 2 years of experience and any background related. Have strong understanding about Conceptualize, visualize and design user experiences (user research, customer journey, prototyping), can translate business process into wire frames, conduct usability testing, typography, layouting, coloring. Familiar with sketch app, adobe illustrator, Adobe Photoshop, Prototyping tools (invision, marvelapp). Bachelor degree in Computer Science or relevant practical experience. Technical experience in data modeling in SQL or NoSQL database. Technical experience in developing and deploying web apps, involved in more than 3 SDLC. Familiar with information security vulnerabilities in Web App (e.g. SQL Injection etc.). Strong user interface design sense and implementation and aware of cross-browser compability and performance considerations willing to learn, share, and teach. Bachelor degree in Statistic, Mathematics or Physics and strong interest about data analyst. Have advance knowledge of statistic. Able to use modelling tools, such as SPSS and programming language with R or Phyton. Willing to with the business team to understanding the change of the business to refresh any new model and prediction to be updated with the actual and update data in the company. Have deep understanding of data lineage of data sources that will be use to be include in the prediction model. Bachelor degree in IT related. Have advanced knowledge of ERP (Enterprise Resource Planning). Able to work in a team and inividually. JobsCDC.com now available on android device. Download now on Google Play here. Please be aware of recruitment fraud. The entire stage of this selection process is free of charge. PT United Tractors Tbk - Recruitment Fresh Graduate United Tractors September 2017 will never ask for fees or upfront payments for any purposes during the recruitment process such as transportation and accommodation.